Vulkollan© is a highly elastic cross linked polyurethane elastomer based in Desmodur©15 with excellent mechanical properties. 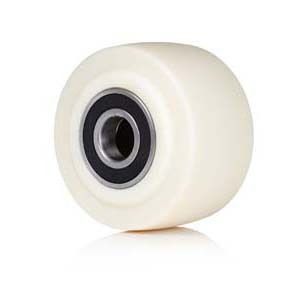 This includes high dynamic load capacity, high abrasion and tear resistance and good rebound mechanics. 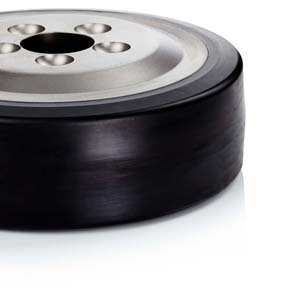 Vulkollan© has the highest modulus of elasticity of all the elastomers and with very high mechanical wear resistance, high impact resilience and low compression set makes it the preferred compound choice for Original Equipment Manufacturers (OEMs) in material handling, industrial truck and Mechanical engineering. 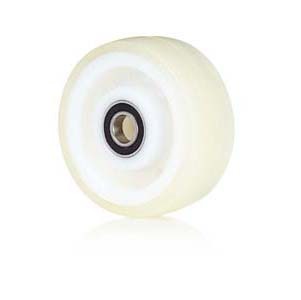 Our high quality polyurethane offers good dynamic load capacity, high elasticity; good mechanical wear resistance and good compression set quality. 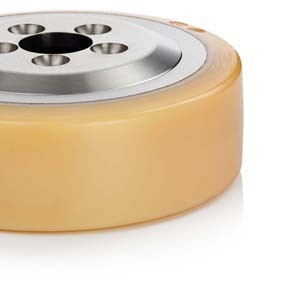 Polyurethane is significantly more resilient that rubber and the preferred tread material for the majority of standard applications with normal mechanical and load requirements. Our polyurethane is non-marking and resistant to a multitude of chemical media. In comparison with polyamides and polyurethanes, rubber is typically softer with a high rolling resistance offering driver comfort and protection to flooring. 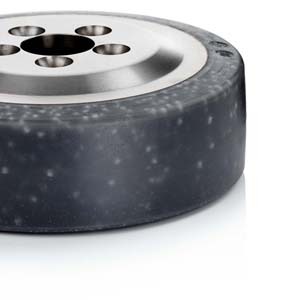 Thanks to the variety of attributes, rubber wheels can be used in a wide range of in-plant transportation applications and in particular operating outside on uneven and abrasive surfaces. We supply solid rubber, elastic and super elastic rubber as well as thermoplastic rubber and pneumatic tyres. Vulkollan©95 Shore A is a highly elastic polyurethane elastomer based on Desmodur©15 for demanding and dynamic areas of application. The excellent mechanical properties of the material include very high dynamic load capacity, very high abrasion and tear resistance, high mechanical wear resilience and very low compression set. We recommend Vulkollan©95 Shore A for the use in the transport of very heavy loads at high speed. Vulkollan© EC is a specially patented material based on Desmodur©15 for deflecting electrostatic charges. Through the addition of electrically conductive components, the discharge is carried out through the entire tread and over the entire contact area, regardless of the tread wear. Our electrically conductive Vulkollan© comfortably exceeds the requirements set by DIN EN 12527 ff standard for electrical volume resistance and is suitable for use in operations where there is risk of fire or explosion. A composite material developed and patented by the manufacturer with a soft shore polyurethane mixed with special TPU granules incorporated into the tread to ensure increased traction, thus improving starting properties, preventing slip and better braking effects. Thanks in part to the lower shore hardness of 85 Shore A, this tread material is particularly suited for use in transportation on wet and soiled surfaces where noise reduction and protection of the products being transported are important factors. Pevodynsoft© 78 Shore A is a new high quality polyurethane elastomer that was developed to offer high dynamic load capacity with significantly reduced starting and rolling resistance. The excellent mechanical properties include high cutting, tear and abrasion resistance. 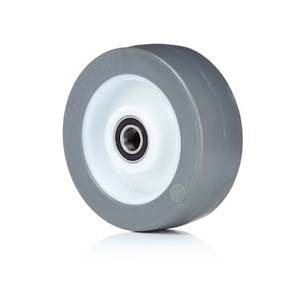 It offers good noise reduction and vibration dampening with additional traction for wet and slippery floors, so ideally suited for use on surfaces where care is needed. Vulkollan© Quartz is a Vulkollan© composite material which has been developed for use on extremely wet, slippery and greasy surfaces. With the addition of quartz sand particles the material has significantly better traction, while the excellent properties of Vulkollan© are preserved as much as possible. Vulkollan© Quartz is particularly effective in the most extreme types of usage such as in the fisheries and meat industries. Nylon is a thermoplastic material based on polyamide which is non-marking, has good chemical resistance, high abrasion resilience and low rolling resistance. Nylon has a high load capacity of up to 2000kgs. The material can operate at high and low temperatures (-40°C to + 90°C) though the load capacity is reduced in temperatures exceeding +35°C. Nylon is particularly suitable for use in freezer rooms, wet rooms and cooking rooms. Cast Polyamide (PAG) has primarily the same excellent physical properties as nylon but has far superior load capacity up to 50,000kgs, has good chemical resistance, high elasticity, good abrasion resistance, easy processability, low moisture absorption and long service life. The material also has high and low heat resistance (-40°C to + 90°C) though again the load capacity is reduced in temperatures exceeding +35°C. 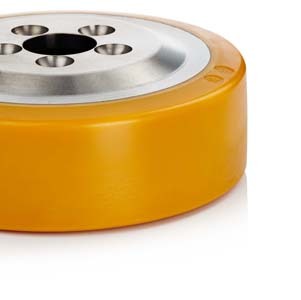 Pevothan© is a high quality processed thermoplastic polyurethane elastomer with excellent properties such as non-marking, high abrasion resistance, good damping power and load capacities of up to 500kgs. Pevothan© is temperature resistant between -20°C to + 80°C. 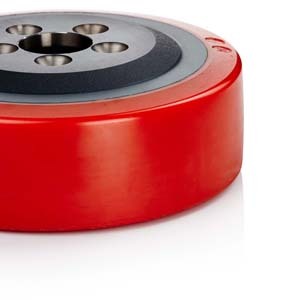 The polyurethane is directly bonded to a nylon centre and is widely resistant to diluted acids and alkalis as well as mineral greases and oils. 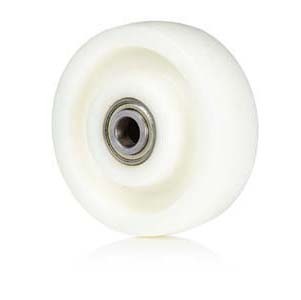 Pevolastic© wheels consist of a nylon centre with a mechanically, non-detachable fixed tread made of thermoplastic polyurethane. The excellent product attributes include non-marking, high abrasion resistance and resilience to diluted acids and alkalis as well as mineral greases and oils. It has a high load capacity up to 1100kgs and the tread is temperature resistant between -20°C to + 80°C.